This topic describes recording command lists and bundles in Direct3D 12 apps. Command lists and bundles both allow apps to record drawing or state-changing calls for later execution on the graphics processing unit (GPU). Beyond command lists, the API exploits functionality present in GPU hardware by adding a second level of command lists, which are referred to as bundles. The purpose of bundles is to allow apps to group a small number of API commands together for later execution. At bundle creation time, the driver will perform as much pre-processing as is possible to make these cheap to execute later. Bundles are designed to be used and re-used any number of times. Command lists, on the other hand, are typically executed only a single time. However, a command list can be executed multiple times (as long as the application ensures that the previous executions have completed before submitting new executions). Typically though, the build up of API calls into bundles, and API calls and bundles into command lists, and command lists into a single frame, is shown in the following diagram, noting the reuse of Bundle 1 inCommand list 1 and Command list 2, and that the API method names in the diagram are just as examples, many different API calls can be used. There are different restrictions for creating and executing bundles and direct command lists, and these differences are noted throughout this topic. The D3D12_COMMAND_LIST_TYPE enumeration indicates the type of command list that is being created. It can be a direct command list, a bundle, a compute command list, or a copy command list. A command allocator allows the app to manage the memory that is allocated for command lists. The command allocator is created by calling CreateCommandAllocator. When creating a command list, the command list type of the allocator, specified by D3D12_COMMAND_LIST_TYPE, must match the type of command list being created. A given allocator can be associated with no more than one currently recording command list at a time, though one command allocator can be used to create any number of GraphicsCommandList objects. To reclaim the memory allocated by a command allocator, an app calls ID3D12CommandAllocator::Reset. But before doing so, the app must make sure that the GPU is no longer executing any command lists which are associated with the allocator; otherwise, the call will fail. Also, note that this API is not free-threaded and therefore can't be called on the same allocator at the same time from multiple threads. The initial pipeline state for the command list. 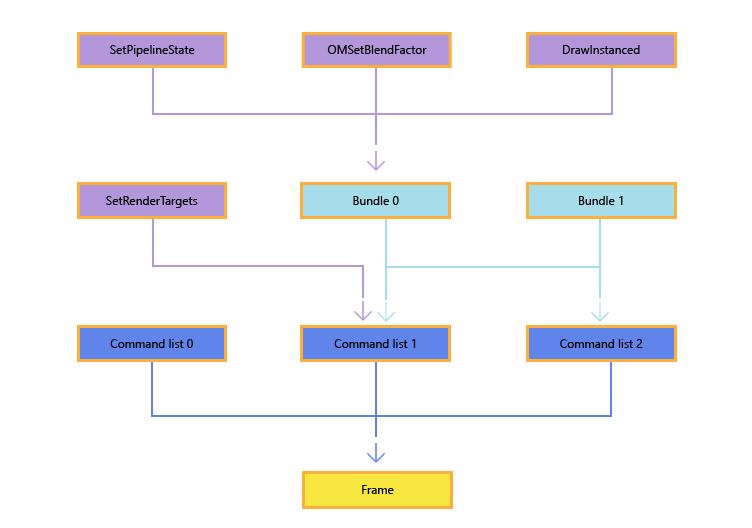 In Microsoft Direct3D 12, most graphics pipeline state is set within a command list using the ID3D12PipelineState object. An app will create a large number of these, typically during app initialization, and then the state is updated by changing the currently bound state object using ID3D12GraphicsCommandList::SetPipelineState. For more information about pipeline state objects, see Managing graphics pipeline state in Direct3D 12. Note that bundles don't inherit the pipeline state set by previous calls in direct command lists that are their parents. If this parameter is NULL, a default state is used. The ID3D12DescriptorHeap allows command lists to bind resources to the graphics pipeline. Direct command lists must specify an initial descriptor heap, but may change the currently-bound descriptor heap inside the command list by calling ID3D12GraphicsCommandList::SetDescriptorHeap. Specifying a descriptor heap at creation time is optional for bundles. If a descriptor heap is not specified, however, the application is not allowed to set any descriptor tables within that bundle. Either way, bundles are not permitted to change the descriptor heap within a bundle. If a heap is specified for a bundle, it must match the currently bound heap in the direct command list that is the calling parent. For more information, refer to Descriptor Heaps. Immediately after being created, command lists are in the recording state. You can also re-use an existing command list by calling ID3D12GraphicsCommandList::Reset, which also leaves the command list in the recording state. Unlike ID3D12CommandAllocator::Reset, you can call Reset while the command list is still being executed. A typical pattern is to submit a command list and then immediately reset it to reuse the allocated memory for another command list. Note that only one command list associated with each command allocator may be in a recording state at one time. Once a command list is in the recording state, you simply call methods of the ID3D12GraphicsCommandList interface to add commands to the list. Many of these methods enable common Direct3D functionality that will be familiar to Microsoft Direct3D 11 developers; other APIs are new for Direct3D 12. After adding commands to the command list, you transition the command list out of the recording state by calling Close. Pipeline state objects - These are used to set most of the state parameters of the render pipeline from within a command list. For more information, see Managing graphics pipeline state in Direct3D 12. Descriptor heap - Apps use descriptor heaps to manage pipeline binding to memory resources. Resource barrier - This is used to manage the transition of resources from one state to another, such as from a render target view to a shader resource view. For more information, see Using resource barriers to synchronize resource states. // Create an empty root signature. // Create the pipeline state, which includes compiling and loading shaders. // Enable better shader debugging with the graphics debugging tools. // Define the vertex input layout. // Describe and create the graphics pipeline state object (PSO). // Create the command list. // to record yet. The main loop expects it to be closed, so close it now. // Define the geometry for a triangle. // code simplicity and because there are very few verts to actually transfer. // Copy the triangle data to the vertex buffer. CD3DX12_RANGE readRange(0, 0);        // We do not intend to read from this resource on the CPU. // Initialize the vertex buffer view. // Create synchronization objects and wait until assets have been uploaded to the GPU. // Create an event handle to use for frame synchronization. After a command list has been created and recorded, it can be executed using a command queue. For more information, see Executing and synchronizing command lists. Most D3D12 APIs continue to use reference counting following COM conventions. A notable exception to this is the D3D12 graphics command list APIs. All APIs on ID3D12GraphicsCommandList do not hold references to the objects passed into those APIs. This means applications are responsible for ensuring that a command list is never submitted for execution that references a destroyed resource. Most APIs on ID3D12GraphicsCommandList do not return errors. Errors encountered during command list creation are deferred until ID3D12GraphicsCommandList::Close. The one exception is DXGI_ERROR_DEVICE_REMOVED, which is deferred even further. Note that this is different from D3D11, where many parameter validation errors are silently dropped and never returned to the caller. Restrictions enable Direct3D 12 drivers to do most of the work associated with bundles at record time, thus enabling the ExecuteBundle API to be run with low overhead. All pipeline state objects referenced by a bundle must have the same render target formats, depth buffer format, and sample descriptions. SetDescriptorHeaps can be called on a bundle, but the bundle descriptor heaps must match the calling command list descriptor heap. If any of these APIs are called on a bundle, the runtime will drop the call. The debug layer will issue an error whenever this occurs.